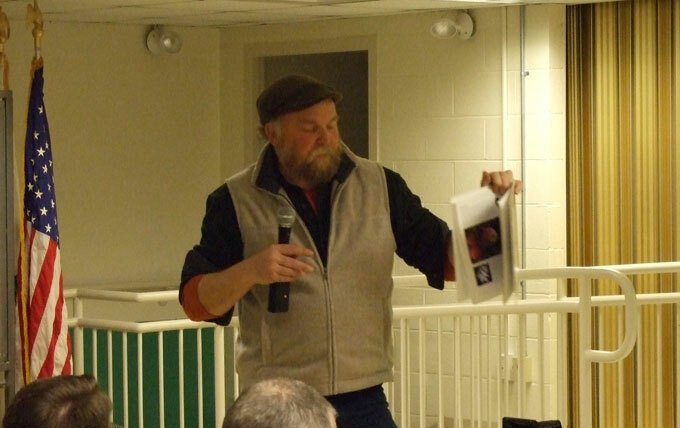 The annual winter meeting of the PA Backyard Fruit Growers was well attended and focused on the topic of growing organic apples in the home garden or orchard. The main speaker was Michael Phillips author of “The Apple Grower,” an incredible book loaded with information related to ecological apple growing. Also on hand to present a lecture on cultivating organic apples was Greg Krawczyk of the Penn State University Organic Research Program. I met Michael at last winter’s PASA conference where I listened to him lecture and picked up a copy of his book. Michael tends an apple orchard called “Lost Nation Orchard” in New Hampshire and shared a wealth of knowledge about organic apple growing. Healthy apples reflect soil health, tree health, and eco-system health. Nutrient density and flavor in fruit is the result of life density in the soil. There is an essential role played by microscopic Mycorrhizal Fungi in the growth and health of an apple tree. These important fungi can be introduced through commercial mycorrhizal inoculants or by incorporating a sample of soil that is respectfully gathered from an established wild apple tree. Orchard Floor Diversity – the use of companion plants and herbs such as comfrey, red clover, buckwheat, and goldenrods in the orchard to promote strong, healthy trees and fruit. Tree health and vitality, fruit storage quality, incidence of disease, and other factors are all tied to the balance and levels of nutrients maintained in your soil. Holistic gardening philosophy – A reverence for all life in the garden is important because there is so much that we don’t know about the interactions that take place in nature and between various insects. The advantages of applying gentler organic sprays that employ pest specific toxins (such as Dipel and BT) or insect repellent attributes (such as neem, garlic, and Kaolin clay). How to control insect pests with physical barriers such as kaolin clay, white sticky traps, mesh guards around tree trunks, and red sticky spheres. More of the gardener’s time should be spent on strengthening their tree’s immune systems rather than to concentrate on killing every bug in sight. Organic elements such as neem oil, neetle tonic, horsetail tea, garlic extracts, horseradish infusions, compost teas, and seaweed extracts that can promote immune support and stimulate the natural defenses of your fruit trees. Recommended Orchard Fertilizers include carbon-rich unturned compost, calcium sources such as rock dust, azomite clay, kelp meal, greensand, gypsum, and unpasteurized fish products. There is something special about growing food that has a way of enlivening the “spirit,” and we can not separate health from the way in which our food is grown. Everything that we do in the garden has ramifications throughout the garden and beyond it! Additional apple culture information covered included the growth cycle of apple tree feeder roots, the big three insect pests in the apple orchard, alternatives to fungicides, and other critical management issues for orchard health. Good tips for growing organic apples trees.. Great job Michael and Thanks for sharing these tips with us.. I am interested in more detailed information related to growing organic apple trees..